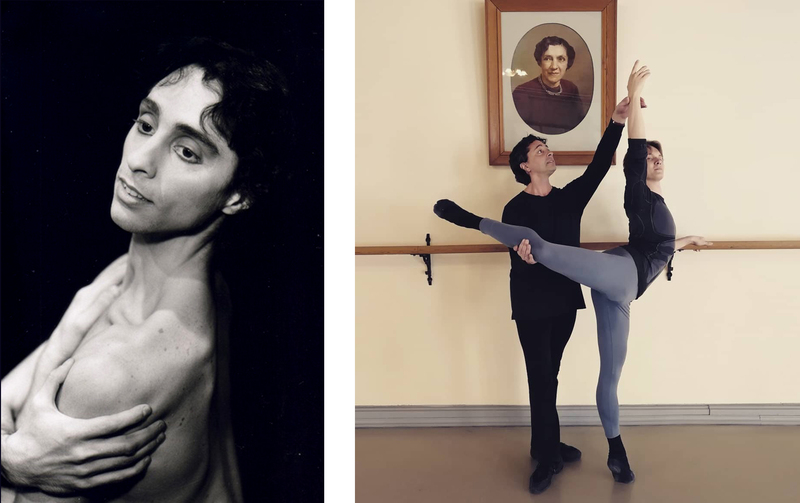 Ervin Zagidullin graduated from Vaganova Ballet Academy in July, having trained under Fethon Miozzi, and has since joined the crème de la crème of St Petersburg ballet in the Mariinsky Theatre’s corps de ballet. During his academic career, Ervin made something of a splash at several major ballet competitions. Most notably, he won third place at the 2016 Vaganova-PRIX and made it into the finals of this year’s Prix de Lausanne. Ervin’s key to success? Hard work and an unrelentingly positive attitude! Ervin, could you say a few words about your journey and how it all began, please? Where are you from? Does your family have any ballet connections? How and when did you decide to pursue ballet as a career, and was your family supportive of your choice? I was born in Kazan. My mother was a teacher at a dance club for children, and I started attending classes there when I was in preschool. My mom trained as a gymnast but had always longed for ballet. My father is in the army. It was my mom who made the decision to take me to a ballet school because she saw in me the makings of a dancer. At her suggestion, I enrolled at the Kazan Ballet Academy in 2009. Naturally, my family was thrilled and proud that I was pursuing an artistic career. I spent six years at the Kazan Ballet Academy before deciding to try my luck at auditioning for Vaganova Ballet Academy. Vaganova Ballet Academy auditions are highly competitive. What was your experience like? To be honest, I wasn’t nervous. I knew I would get in! And I was right. I was accepted into Grade 7 / Level II, but I decided to transfer to the year below. Grade 7 / Level II curriculum includes advanced lifts, and I was only fifteen years old; I was afraid that I would hurt my back. What advice would you give to a child who wishes to become a ballet dancer? Set a goal and work towards it! Never say “I can’t” or “I don’t want to”. Instead, tell yourself: “I will do it. I will get there!” Don’t strive to be better than everyone else; your goal should be to best yourself! At Vaganova Ballet Academy, you studied under Fethon Miozzi. Could you talk a little about him and his classes, please? I get the feeling that he is a remarkably warm person, who adores his students. I would say that Fyodor Ivanovich, that is what we call him, is one of the best teachers in the world! He is very demanding, which is the thing I like most about him. You can’t help but really apply yourself in his class. His classes are very particular: we spent a lot of time working on fine technical elements and on weigh techniques. He is a sunny and kind person, one you can always have a heart-to-heart talk with; someone you can have a laugh with. He always supported me in difficult situations and lifted my spirits! I owe him a lot! Do you remember your first performance at the Mariinsky? What was it like? It was one of the winter performances of “The Nutcracker”. I played the Moor. Naturally, I was utterly mesmerised by the beauty and the scale of that stage! During your time at the Academy, you had performed a significant number of roles. Among them: Actaeon, Matteo from “The Naiad and the Fisherman”, and one of the Pierrots from “The Fairy Doll”. Do you have a favourite role or a role of great personal significance to you? That would be the male variation from “Paquita”. The one Fyodor Ivanovich and I worked on for Prix de Lausanne. Ervin Zagidullin. Classical variation from “Paquita”. Prix de Lausanne finals. February 2018. Ervin Zagidullin, Davide Loricchio and Maria Khoreva in Vaganova Ballet Academy production of “The Fairy Doll”. Mariinsky Theatre. March 2018. This year, Vaganova Ballet Academy students toured Europe and Asia. You got to perform in Naples. What is your impression of Italy? Oh, I will remember that tour for the rest of my life! I couldn’t get enough of the beauty [of that country]! Especially in Venice – a magical city with stunning architecture. My friends and I spent an entire day walking around, and I couldn’t believe that I was really there in that indescribably place! You performed a complex repertoire, one that carried great responsibility, at this year’s Vaganova Ballet Academy’s graduation performance: pas d’action from “The Naiad and the Fisherman” and “Suite en Blanc”. How did you prepare for the two roles? It took diligent daily work. These two roles are entirely different, but I like them equally for their individuality – that special “something” that sets them apart. The role of Matteo appealed to me because it offers an opportunity to act and to really explore the character, while “Suite en Blanc” drew me with its precision, beautiful music and new movements, unfamiliar to me. Ervin Zagidullin in pas de action from “The Naiad and the Fisherman”. Vaganova Ballet Academy graduation performance at the Mariinsky Theatre. July 2018. I know that, aside from ballet, you are also passionate about music, that you play the guitar and have recently released a single you recorded with your brother. What is music to you? What role does it play in your life? To me, music is like [my] soul! I lose myself in it. When I play the guitar, it is as if I dissolve in the sound and travel to another world. Yes, my brother and I decided to create something together. I was my first experience [recording music]. Do you have a favourite ballet danseur, someone you’d like to emulate? Of course I have a favourite artist – in fact, I have several – but I don’t have an idol. I don’t want to be like someone else or to emulate anyone. I want to be myself and continue to improve and get better. How do you perceive a danseur’s role in ballet? I think everyone’s role is essential in ballet, as they all complement each other and help complete the picture. You won second place Vaganova-PRIX in 2016, took part in the national ballet competition in Moscow in 2017 and made it into the finals at the 2018 Prix de Lausanne. Could you talk about your experience at these competitions, please? Do they share any similarities or are they very different? I had both the most difficult and the best time preparing for these! At competitions, there are always people who are better than you at some things, and it actually motivated me to win, though I wasn’t always successful. I was more comfortable at Vaganova-PRIX because I was on home soil, as it were. Things were a bit tenser in Moscow. I do not usually get nervous, but I got a little agitated, and it may have affected my performance. I felt very at home in Lausanne, especially on the stage, because of the raked floor. That was the most challenging competition [I have ever been a part of] because it lasted for a week and there were a great number of competitors. I think that every competition has a different atmosphere, but the most important thing about them is that you get to forge new connections or meet old friends you had previously competed against. Ervin Zagidullin. Actaeon’s variation from “La Esmeralda”. III National Ballet Competition “Russian Ballet”. May 2017. Ervin Zagidullin. Contemporary variation “Out of Breath”. Prix de Lausanne selections. February 2018. What advice would you give to a student or a young artist who is preparing for a competition? Never be nervous! Do everything you teacher has taught you! And of course, good luck! What is your happiest memory from your days at the Academy? And have you ever been down? Playing the guitar with my friends in the Academy’s courtyard! I pretty much never feel down. I am a very positive person! Have you ever wanted to quit ballet? You chose a challenging career, one that demands exhausting daily toil and sacrifice. What motivated you to keep going? I would say that I am driven by a desire rather than motivation: a desire to become a great artist! I will continue to work towards this goal and strive to achieve it! Ervin’s dream role: Spartacus from Yuri Grigorovich’s production of “Sparatus”. Performed here by Vladimir Vasiliev. 1972. Are there roles you dream of? Choreographers you hope to work with? Or other companies you wish to dance with? I dream about dancing the role of Spartacus in Yuri Grigorovich’s production. Every time I re-watch that ballet, I am overwhelmed with emotion and a desire to improve myself. At the moment, I would like to work with Vladimir Varnava, and, since we are talking about dreams, I want to dance with the Royal Ballet, Straatsballet and other prestigious companies. What is ballet to you? It is a part of my life, my career, toil, joy and sweat. Posted in UncategorizedTagged ballet, interviewBookmark the permalink.